Leading Manufacturer and Trader from Sambalpur, our product range includes Working Tables such as Stainless Steel Working Tables and Working Table. With the assistance of our deft team of professionals, we are able to introduce a broad array of Working Table. Such table is installed and use at eateries, restaurants, hotels, commercial kitchen and food stalls. This table is comprises of high quality bar and materials, which offer resistant to corrosion and leak proof tenure. It is manufactured adhering to international industry standards and quality norms. In order to ensure high safety, our professionals opt for strict quality tests made on the complete table setup. We are successfully ranked amongst the topnotch entity offering a wide range of Stainless Steel Working Tables. These tables find wide application use in eateries, restaurants, hotels, commercial kitchen and food stalls. 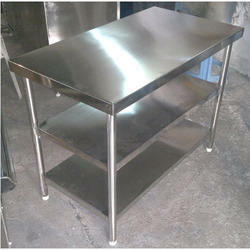 The offered tables are manufactured using quality stainless steel material and latest techniques. Also, the manufacturing process adheres according to industrial norms so that quality and reliability can be made assure on the tables. Apart from this, clients can get the tables from us at industry leading prices. Looking for Working Tables ?